Nigeria’s aviation sector senior staff union yesterday, warned that it would frustrate the take-off of Nigeria’s new carrier, Nigeria Air, over the failure to settle an outstanding N45 billion severance pay owed ex-workers of the defunct state-carrier, Nigeria Airways. A joint statement by the National President and Secretary of the Air Transport Services Senior Staff Association (ATSSSAN), Mr. Ahmadu Ilitrus, and Frances Akinjole, lamented the failure of the Federal Government to settle the outstanding entitlements of ex-workers of Nigeria Airways about 15 years after the Airline was liquidated. The union said about 960 ex-workers of Nigeria Airways have already died “in very avoidable health conditions while waiting for their entitlements, with the families they left behind abandoned by the government. 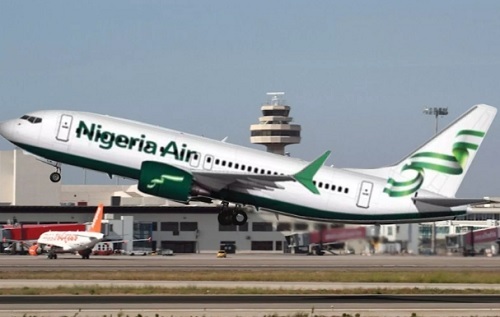 “ATSSSAN warns that if the government does not pay Nigeria Airways ex-workers their hard earned entitlements, it cannot guarantee any place for the new airline in the industry,” Ilitrus and Akinjole said in the statement. “We have resolved that the issue of payment of the severance benefits of ex-Nigeria Airways workers must be resolved immediately to forestall brewing labour issues that could affect negatively the prospects of the recently unveiled Nigeria Air by the Federal Government of Nigeria,” the statement added. The labour union noted that while President Muhammadu Buhari had given approval for the payment N45 billion towards the settlement of the entitlements some time last year, the Federal Ministry of Finance had failed to heed the presidential directive by releasing the money to the retirees. Meanwhile, the union also condemned the manner in which the management of Bi-Courtney Aviation Services Limited (BASL) unceremoniously terminated the appointments of 26 of its staff who voluntarily joined ATSSSAN. “To this end, we have resolved that if the management of Bi-Courtney does not recall the terminated staff and allow unfettered unionisation of willing staff of the company within two weeks from the date of the publication of this communique, ATSSSAN shall embark on a series disruption of operations at MMA2 until the management of BASL complies with its demands,” the statement added.